Amarige Perfume & Fine Fragrance - Amarige EDP, Amarige Body Products - UK Perfume Guide. Givenchy Amarige, an anagram of the French word for Marriage "Mariage", was created in 1991 as a rich floral perfume for women. Givenchy wanted to convey the bliss and joy of a summer evening by the Mediterranean, while Givenchy Amarige also projects the radiant charm of the eternally feminine, with a rich bouquet of yellow flowers. 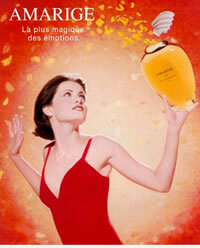 Givenchy Amarige is an exceptionally feminine scent that presents a luxurious and emotional blend of floral notes. Givenchy Amarige is a beautiful, elegant blend of violet, mimosa, soft sweet spices, and orange flowers, accompanied by fruity notes of fresh citrus, melons, peaches, and plums. Givenchy Amarige is almost completely composed of a bouquet of yellow flowers, centred around mimosa, with orange notes from neroli and orange blossom, tuberose, and black currant and gardenia, lightened with a touch of rosewood. A warm woody cashmerande end note mingling with soft musk anchors this floral bouquet. This gives a joyful, romantic flavour to this enduring and sophisticated floral perfume for women.